Browse content similar to North Wales. Check below for episodes and series from the same categories and more! For many, the 1950s were the golden age of British motoring. Back then driving was leisurely, liberating, and fun. Yes, things have changed a bit since then. But perhaps it's still possible to recapture some of that old magic. as recommended by the guidebooks of the era. And I'll be driving them in some of the decade's most iconic vehicles. I want to find out if these routes still thrill and inspire. This is a spectacular road. And how in 50 years Britain itself has changed. Oh, for God's sake. They wouldn't have thought to come here without a sat nav. People don't value each other as much as they did then. It was a different type of life, wasn't it? "yet its mountain scenery on a miniature scale is as impressive. "The mountains of Wales have a real character of their own. "out of all proportion to their actual physical height." 1957 this car was made. Because it was made in 1957, you are exempt from wearing seatbelts. it must have seemed like it was from another planet. inspired, of course, by America. And, for the time, it was pretty racy. This model had a top speed of 90 miles per hour. Although I don't think I'll be pushing it quite that far. The steering is just a little bit unresponsive. Turn the wheel to turn and it actually takes a couple of beats before it actually does it. I'm in North Wales to drive a route that in 1959 was reckoned a must for any motoring tour of the region. "several of the most handsome lakes, and the most impressive of all the passes." Although these antiquated publications can't always be totally trusted. this modern looking bridge here was a road bridge. You could actually drive along here and into Caernarfon. So the guide book of the '50s is way out. All my guidebooks, of course, recommend a visit to the castle, and very impressive it is. But Caernarfon Castle doesn't have entirely happy associations for the people of Wales. I've arranged to meet author and Welsh language expert Bethan Gwanas to find out more. the director seems obsessed with filming in the most precipitous possible places. -You'd think with a driving show, heights won't come into it! And I don't quite know why he's so amused at the thought of me plummeting from the parapets! That's a funny image. I'm rocking back with laughter! At least you'd lose your bloody job. So, Bethan, here we are in Caernarfon Castle above the cloud line. Isn't it true...I heard from a guide today that the Welsh weren't allowed in this castle? -and as you can imagine that depressed us a bit. to keep the Welsh in check, and then all the Welsh had to live outside the castle walls. so that made us feel quite inferior, you can imagine can't you. I can see his reasoning. If you have your own language, you've still got that pride, haven't you? ..assimilate us, make us English as well. But he didn't succeed, did he? We're still here! You're still here and talking Welsh. Yeah, and we're allowed in the castle now as long as we pay. But it seems Edward's dastardly dream almost came true. Even 50 years ago the Welsh language was still on the back foot. but they'd have been hard pressed to read it anywhere. If you had been driving around here in the '50s, English would still have been the official language. All the signs, everything, you know, menus, whatever, would have been in English. and I remember it was quite difficult to buy a birthday card in Welsh. -Yes, it really was, because everything was in English. -In the '50s and '60s, even the '70s. It was very recent. Basically we've got more pride now. Would you like a lesson now? -I could teach you how to say Caernarfon Castle in Welsh. -Hey, you've just got the hardest sound in Welsh almost right. -The double "L", you just put your tongue against the back of your teeth, just there. -Is that what I sound like? 'Llanberis, the gateway to the mountains. You're taking your life in your hands! that me, hills, and classic cars aren't exactly the perfect mix. Did they have roundabouts in the '50s? -Er, I don't suppose they did. -Right, I'm glad you're having such a good time. When you meet somebody, you'll want to say hello, won't you? -That's quite easy. Round here you would say "helo". How are you is "shw mae". -Helo, shw mae? Hello, how are you? -And very good is "da iawn". -Yeah. OK. So you ask me how I am. Er oh, helo shw mae? -You can just keep going like that. What is the Welsh for tailback? Um, I would say cynffon, which means tail. 'I can safely say it's not the easiest language in the world. -Now this is Llanberis, we're here. -Oh, look it's pouring. I'm sorry. -Are you kicking me out in the rain? "In the mountains a few miles can make a big difference. "The rainfall at Llanberis for instance is close to 100 inches a year. "At Caernarfon, less than ten miles away, it is not much more than a third of that." 'It's into those unpredictable and dramatic mountains that I'm now heading. Extraordinary view of the vast slate quarry here. "on the opposite side of the lake. "It rises in step-like terraces for some 1,800 feet. "affords one of the best indications of the immensity of the task." 'At its height, 3,000 men toiled on the side of this great mountain. 'And not surprisingly the quarry dominated life in the local communities. Your father, and your grandfather and everybody was still working there. -It was in the family. -So when you were at school, did you think of doing anything else? -Well, no, to be honest. I wanted to follow in my father's footsteps and be a quarryman, to be honest with you. -Right, and was your grandfather a quarryman? -Right. And was it a dangerous job? -Oh, yes, quite dangerous, yes. You had to pay for everything. Even your tools, you had to pay for them. -What, the company sold it to you? -and you had to pay him even for them to be sharpened up for you. that the quarry mill would hang you from. Aye. -people try to make a short cut sometimes, you know. -which meant you'd have more for the next time, you know. It's surprising they paid you at all, really, isn't it?! But Dinorwig is no longer the hive of activity described in my 1950s guidebooks. leaving this breathtaking, but eerie site. When the quarry closed it must have affected the amount of work available. Oh, it did. Yes, yes, yes. There were so many people hunting to find work after that, you know. Thousands would be out of work. Well, yeah. It affected the community as a whole, to be honest with you. -You might as well say it killed the community life in the village. -Because it was such a happy place to work in, you know. -Although it was hard work, everybody knew one another and they were all happy together, you know. 'The great Welsh quarries, like so much of Britain's heavy industry, are pretty much all redundant now. 'although it was tough, dirty, often gruelling work, people still look back on them fondly. 'These huge employers, it seems, acted like a glue that bonded whole communities together. I can see the path ahead, now. It does look quite dramatic. "The finest mountain road in Wales. "Shattered masses of every form, which have fallen from the heights, lie in strange confusion. "On the sunniest of days, it is a wild scene. "In cloudy or stormy weather, a scene of utter desolation." it's just millions of individual rocks. I suppose it's been like that since the glacial times. Everything looks like it's just strewn with rocks. 'and many believe that modern rock climbing was born here in the 1950s. 'I've come to meet an extraordinary chap, who knows these mountains like the back of his hand. And so, how old are you, if you don't mind me asking? -And are there lots of 70-year-old climbers? If you fell now, you could do yourself serious damage. Is it harder going down than going up? Yes, yes. It hard to see your feet. Cos you've got to look backwards? Especially on this rock where the holes tend to be a bit sloping. -So what sort of rock would you call this? Have you always got three bits of your body in contact? That's the way when you learn to climb. That's the system you use, always have three points of contact. But if you don't know how to climb, that's not possible always. Maybe you've got just one hold, and then just launch yourself. So, the three point of contact rule is only for beginners. 'Back when he was a mere slip of a lad at 61, Eric base jumped form the world's highest waterfall. 'Just one of his many achievements. 'He was also the first British climber to solo the north face of the Matahorn. Well, danger seems to spring to mind quite a lot. Is danger an adrenalin buzz for you? Yes, I must admit it is a factor. I think it is for everybody or most people who do these sports. If climbing was safe, or if parachuting was safe, it wouldn't be as popular. I'm sure. And did you start around here? 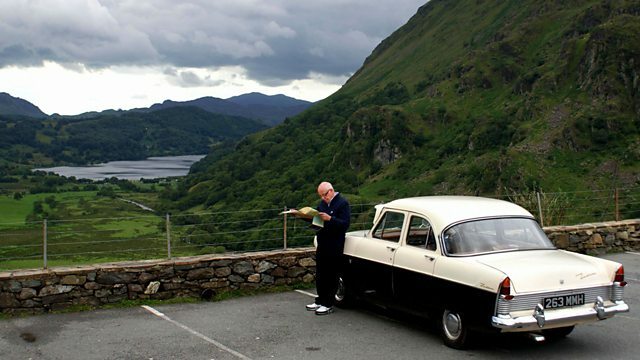 I started down the years in the Llanberis Pass, yes. This place has real special memories for me. They were magic days. Yes, yes. Amongst climbers, is this a testing area, North Wales? I think I'm biased, but I would say it's the best area in the country. Although, Scottish climbers would disagree, I'm sure, but it is pretty unique. 'What a remarkable chap Eric is. 'let alone dangling by my fingertips from the top of these mountains. 'But I can understand why Eric's heart belongs here. So instead of all this rock, we now have green lush hills. I think it's time to get out and have a look. As far as you can see are sheep, little dots of sheep. Up here, all the way down the valley. "for the honour of being the loveliest village in Wales. Well, of course in this modern day we've got these monster trucks, monsters that come here. And these roads weren't built for that. -So why do they come this way? -The old "sat naff" as we call it - sat nav! -Sat naff - they send them this way. -So they send them here? And they wouldn't have thought to come here without a sat nav. and looked which route to come through the mountains of Snowdonia. They think it's a short cut, but it's not. They get stuck in every corner going, I think. The bridge gets battered about a bit. are some of the most beautiful bridges in Wales. Listed buildings. These monster lorries, they pull them down. Destroying them. 'Perhaps there's something to be said for navigating the old way. OK. Hi, could I have a passion fruit sorbet, but could I have two cones? Would you mind? I want to split it. That's right, two small ones. -What one do you sell most of? I'm sharing it with Ian and the camera here. Who would like to share a raspberry pavlova with me? I wasn't going to have any ice cream, I ended up having two. C'est la vie. It is Saturday. 'back towards where I started in Caernarfon. -Are you going our way? I think you'll have to tell me where to go. back when it was the pride of Billy Butlin's empire 50 years ago. -And that was over the tannoy? -No, no, no. Wherever you were. The ballrooms. 'Butlin's Pwllheli dominated the holiday industry in 1950's North Wales. Everybody who came to Butlin's came to have a good time. And they did. And we were here to make sure they did. It was real good innocent fun. Do you remember the times we used to have down here? There was knobbly knees for men. -And was there lots of romances amongst the staff? -Oh, yes, yes, I think so. Yes. I think there were seasonal affairs, you know. Maybe re-kindled or maybe move on, you know. -With Rory Storm and the Hurricanes and Ringo Starr. -Ringo Starr was here was here. Yes, with his old band, though, before he joined the Beatles. -I actually went out with Ringo while I was here. What could have been, you see, what could have been. It's my claim to fame. We used to have parties on the beach. Sometimes you went swimming at night, which, really, I suppose was quite dangerous. -I can't admit to doing that, no. But I won't admit to doing it. -We might have, but I can't remember that far back. 'The girls clearly had a ball working and living on the camp. You all seemed to have had a very good time. You enjoyed yourselves. We didn't have much, but what we had we all enjoyed. It was a fabulous time. We made the most of what we had. Would you say that the '50s were a better time, by and large? There wasn't the worries about leaving people or meeting people. So it was, you know, a lot nicer in that respect. they just got what they could afford and made the most of it really. Cos we're talking, really, the '50s, we were still recovering from the war. -Cos you were very young then. that's a Butlin's holiday camp badge from 1958. Oh, that's lovely, thank you very much. -That's a little memento for you. There you are. You're a camper now. -Not a camper van, a camper. I better find a chalet. 'that the girls truly cherish from the '50s. 'Something, I suppose, epitomised by those Butlin's glory years. 'It's true to say that much of that has faded over the past half century. Well, that's the end of our Welsh drive. One of the best drives in Britain, there's very little doubt about that. I think the thing you take away from here is this scenery, the wonderful Welsh scenery. there seems to be much more pride in the country than I remember. They've got every right to be. It's a very beautiful country and it's been a very beautiful drive and certainly one of the best in Britain.